The Mountain Rides Transportation Authority board voted unanimously Wednesday to select a Pocatello firm for a contract to design and provide engineering and construction management services for a South Valley Transit Center to be built in Bellevue. Wednesday’s vote, held at a special board meeting, does not guarantee the work will go to Jenson Hayes Shropshire Architects, but authorizes Mountain Rides staff to begin negotiations on a contract. Once drafted, the contract would be subject to board approval. Jensen Hayes Shropshire was one of two companies that responded to a Mountain Rides request for qualifications issued in May. The other respondent was Vital Ink Environmental Architecture in Bellevue. Both firms were interviewed and evaluated by a selection committee. Mountain Rides Executive Director Jason Miller said at the meeting Wednesday that the committee overwhelmingly chose the Pocatello firm for the contract. Mountain Rides board member David Patrie, who served on the selection committee, said Jenson Hays Shropshire showed more enthusiasm for the project. Miller said JHS has extensive experience in public works projects and that a background check was made with agencies that have previously employed the company. 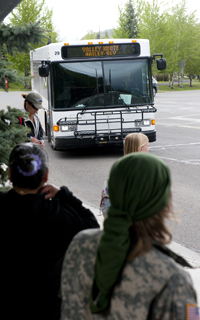 Mountain Rides has been working for several years to establish a transit center in the south valley to house Valley Route buses that begin and end their daily runs between the north and south valley in Bellevue. The facility will be built on a half-acre property comprised of two undeveloped lots in south Bellevue, on the north side of Clover Lane where it intersects Gannett Road. Previously owned by Blaine County, the lots were purchased earlier this year for $125,000. Once finished, the transit center will have a building for maintenance and housing of buses. Mountain Rides intends that the center also have a waiting area for riders and a small park-and-ride lot for commuters. Mountain Rides has $950,000 set aside for the project, with $800,000 of that from a Federal Transportation Authority grant and the balance from the organization’s capital fund as local matching dollars. Mountain Rides intends that 85 to 90 percent of the funding be used for construction and 10 to 15 percent for design, engineering and project management. Those numbers were released in the project request for qualifications. Miller said at Wednesday’s meeting that JHS has expressed no concern about doing the project within budget. Mountain Rides intends that a contract be finalized with JHS later this summer. Construction of the South Valley Transit Center is projected to being in April 2015.